Motobatt is an AGM battery (absorbed glass mat), a type of sealed lead acid battery, get all the benefits of a gel battery at a sensible price. Perfect battery for ATV's Watercraft, Snowmobiles and Motorcycles. Maintenance free, never needs water. 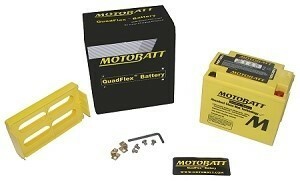 Motobatt batteries are an excellent replacement battery for your ATV. These batteries are maintenance free, which means no dealing with acid or topping off with water. Completely sealed, absorbed glass matt technology. All Motobatt batteries come with a 2-year free replacement, non-prorated warranty direct from Motobatt with original receipt from date of purchase.